All these classes are in our Portland store with a maximum 12 students. Call 503.283.1353 to sign up: no online class registration. Welcome to Georgies' Community Classroom! It's a place to learn and explore this ancient craft while you also explore your personal expression and possibly make a friend or two. Georgies offers clay classes which focus on two specific clay forming skills: throwing on the potter's wheel and hand-building techniques. While watching an experienced potter, it looks so easy, but cllay work is actually a blend of art and learned skill. Our eight week series classes are designed for both beginning and continuing students. It's rare that any beginning class will have only novice students as it takes multiple sessions to form the skill to be able to accomplish many of the steps that go into a finished glazed piece. For most of Georgies' employees and instructors, clay and its many facets are a lifetime pursuit. There are endless ways to form the clay and decorate the surface. Explore form, function, texture, color, and design. An eight week class is a freckle in time: it may be something you want to explore further but it won't be enough time to become a master potter or make all your Christmas presents if you have never worked in clay before. in developing the skills you are learning in your class. 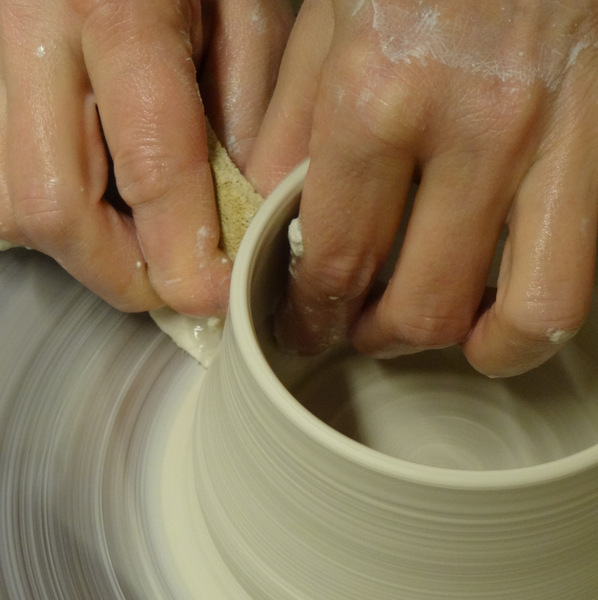 Beginning wheel classes focus on the primary skill of working on the potter's wheel. These skills are centering clay, learning to control this spinning long to raise the walls in both a vertical matter to form a mug, and pulling it out to form bowl shapes. Completing these forms requires another skill that is explored, and that is trimming. Glazing is addressed in the simplest method, by dipping with a wide variety of Georgies cone 6 glazes. 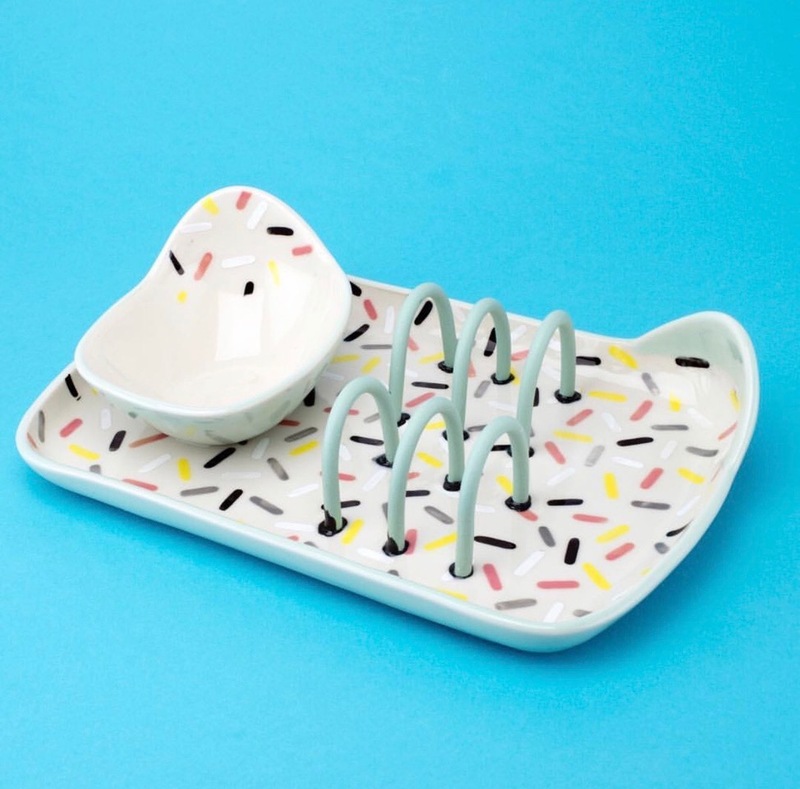 Beginning students can expect to complete several small (cereal-size) bowls and a mug or two (though perhaps not to perfection!). 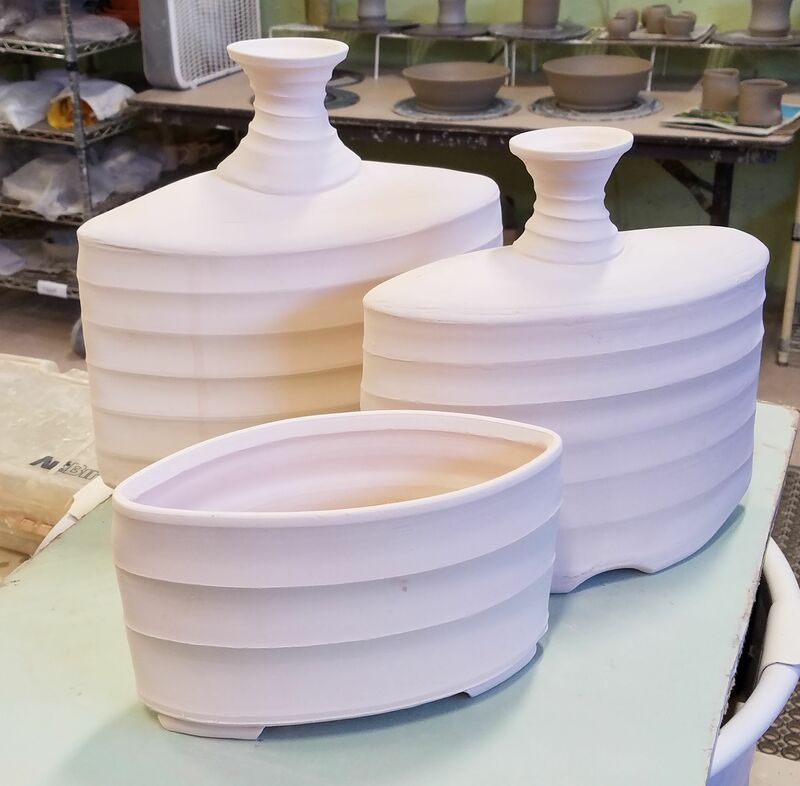 Continuing students will be able to explore these basic forms further, and expand their scale with greater control to larger bowls and more complex cylindrical forms. The more time you spend in open studio, the faster you will develop your skills and control. Many students repeat a class simply because it fits their schedule. Our wheel classes are small, with 12 students per class session, and you are guaranteed a wheel in your class. Click here to see "The Fine Print" for clay classes at Georgies. Intermediate wheel classes are open to all students who were proficient on the wheel, able to center and throw both bowls and mugs without further instruction. 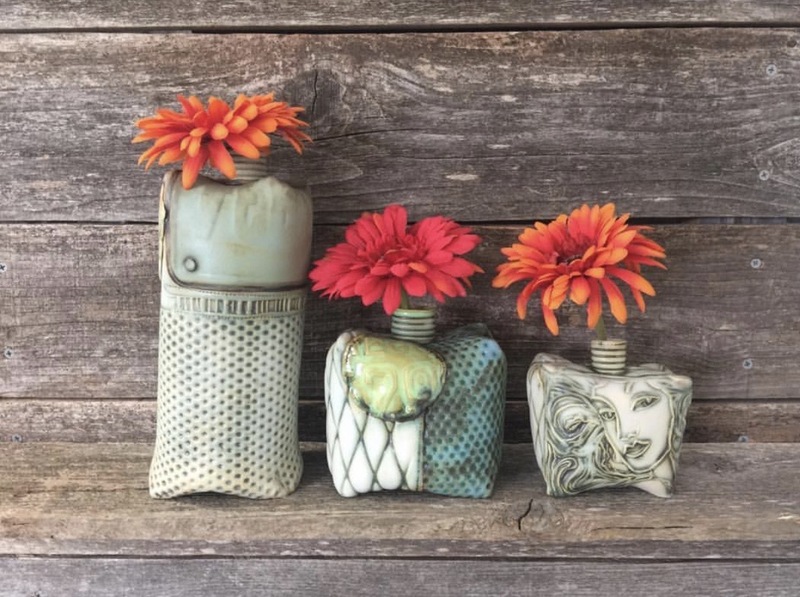 This class explores more advanced wheel forms, like covered and lidded pots, teapots, altered forms, and incorporating elements of handbuilding with wheelthrown work. 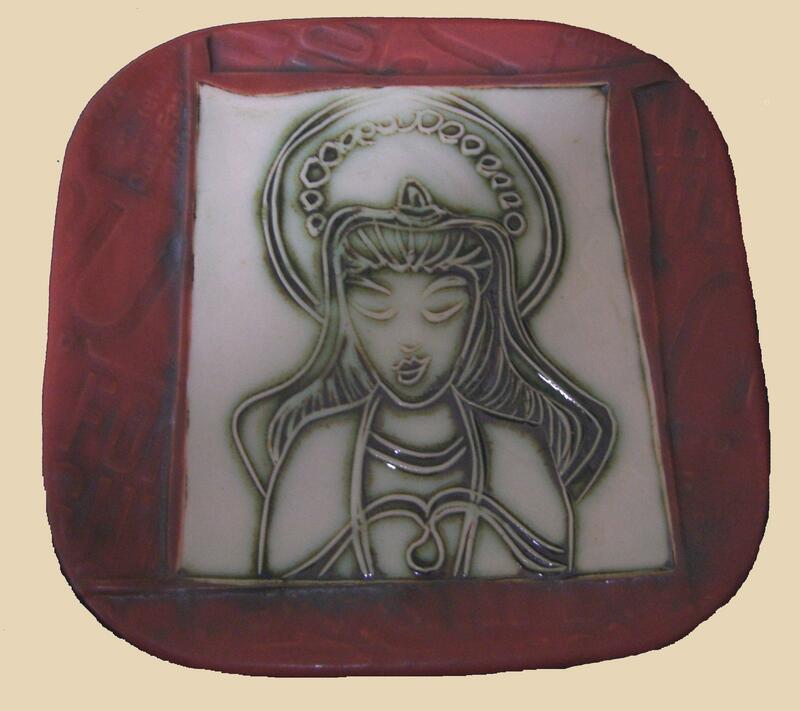 The intermediate class is also able to explore more advanced glaze techniques, making use of wax resist design as well as decorative painting. Click here to see "The Fine Print" for classes at Georgies. Hand-building is often the best place to start your clay experience. Hand building explores many popular methods of clay forming including slab building, pinch pots, and building with coils. By touching and forming clay with these simple unaided methods, you learn the fundamentals of joining clay into cohesive forms. Our hand-building class is open to beginning and continuing students. When we present a specific technique, such as 'soft slab' work, we introduce it with a specific project that teaches the skills needed for that type of work. As you begin to develop your skills, you are able to bring your ideas to fruition. Again, basic glazing skills are explored. unless otherwise noted. Fees include materials and instruction for the designated project. Most classes require basic pottery tools and brushes as listed. Karen is the talented and gregarious representative for Shimpo! This workshop will include wheel demonstrations in the morning and then move into her "hand-on" decorating technique in the afternoon. 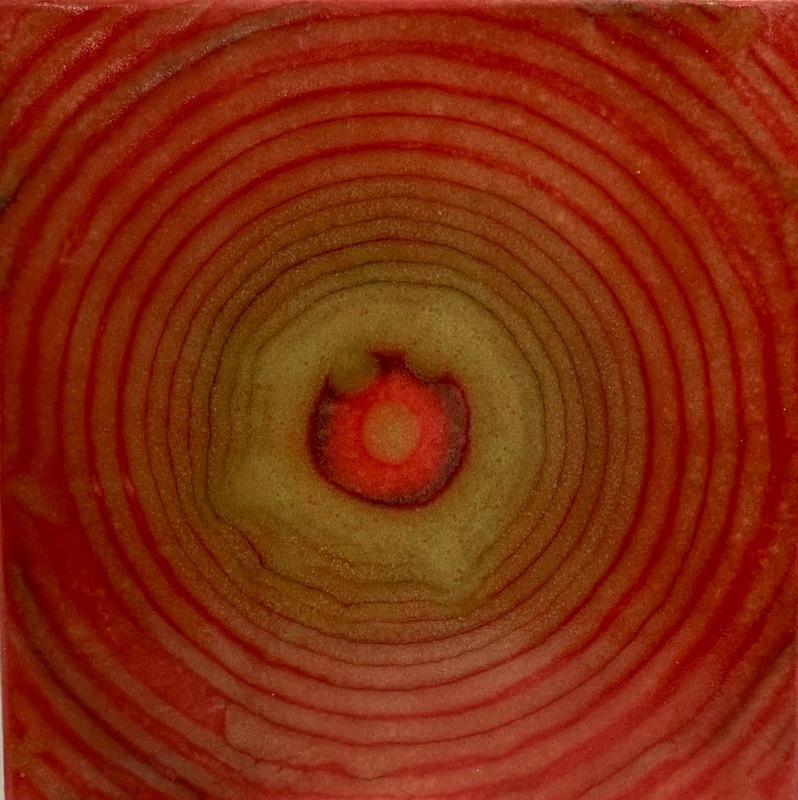 You will work on ^6 bisque tiles for this layering technique. Tiles, designs and glaze materials are included. Bring your brushes for glazing your pieces. This is the traditonal raku class. 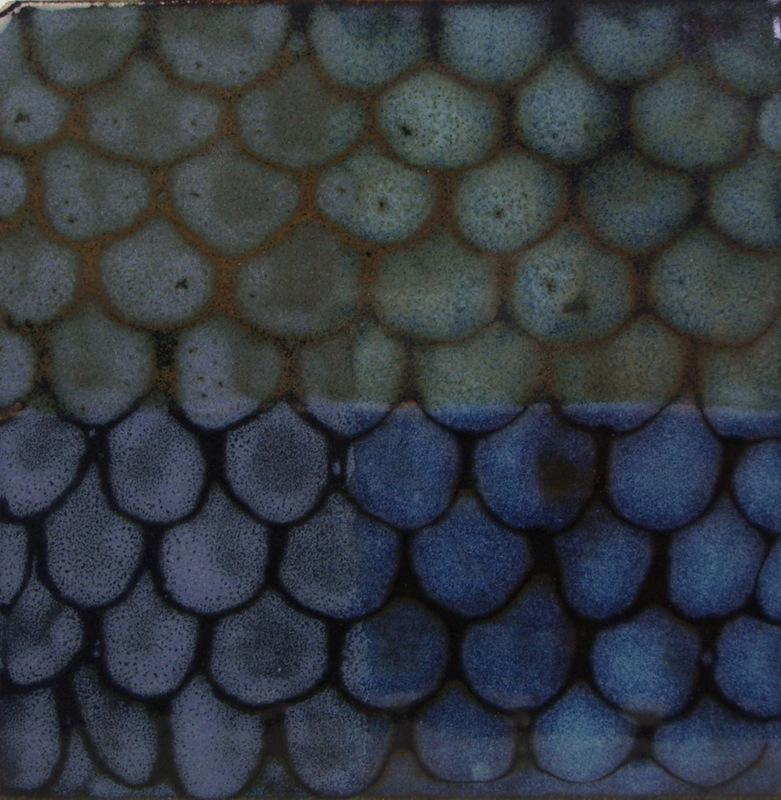 We will be using Georgies Raku glazes with our Trash Can Kiln. Expect lots of color and copper flashing from this exciting fire and smoke-filled process! Bring 2-3 small pieces of ^08 bisque or we will have bisque tea bowls for you to use. 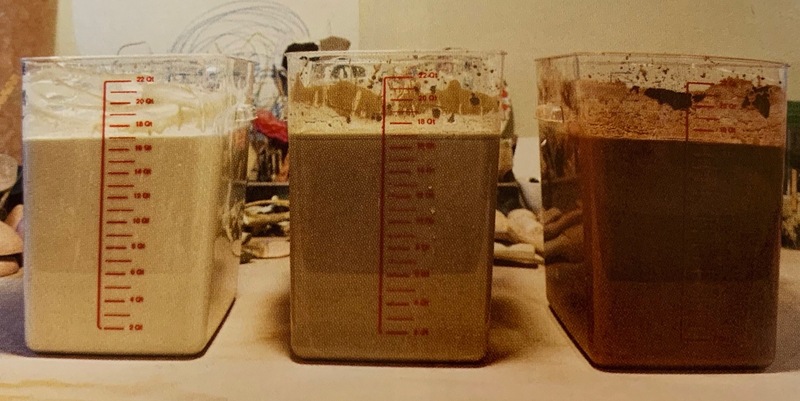 Mason stains allow ceramic artists a full color pallet, but what is behind the chemisty that we need to know to be successful? We will cover their use in glazes, as an oxide, and coloring a clay body or slip. The Mason Stain chart is included and we will show you how to read it. Bring your brushes for glazing your pieces. This "hand on" workshop will let you explore a variety of decorative slip techniques: trailing, patterning and fluting. We will supply a bevy of cups for your expressive touch! Bring your tools and brushes for working with slip. This class was designed for those of you that simply want to try throwing on the potter's wheel. It seems so easy, and yet there is some skill involved. This is a great way to see if this is an art form that you want to explore further with our 8-week classes. This class was designed for those of you that simply want to try throwing on the potter's wheel. It seems so easy, and yet there is some skill involved. 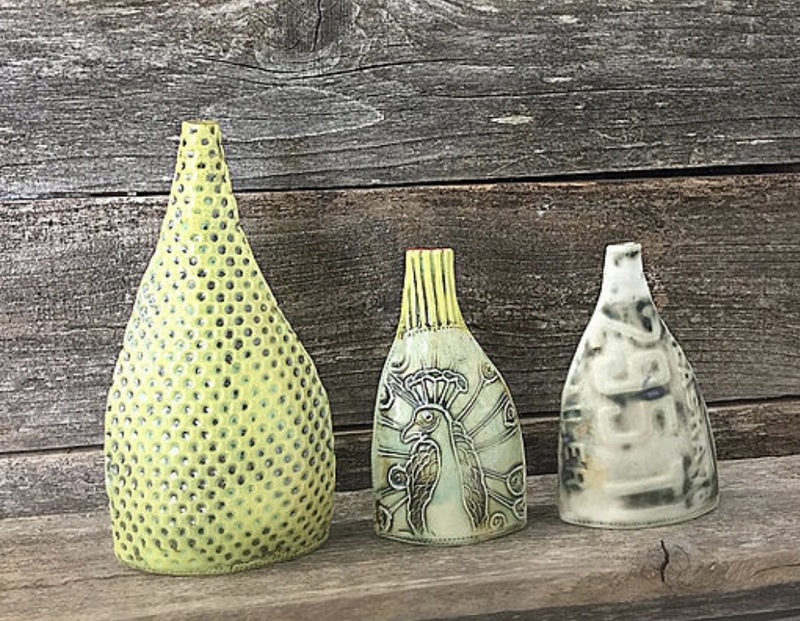 This is a great way to see if this is an art form that you want to explore further with our 8-week classes. .
Brett, from Mudshark, is a master mold maker and we are lucky to have him teach this workshop. You will make a 2-part working mold during this 1 day workshop. Bring several objects to choose from that are the size of an apple or mug. Call early because this class fills fast! SUM229 ~ 9:30am-4pm ~ 1 space available! We are offering two separate classes that include as much information and "hands-on" work that is possible to do in a single day. 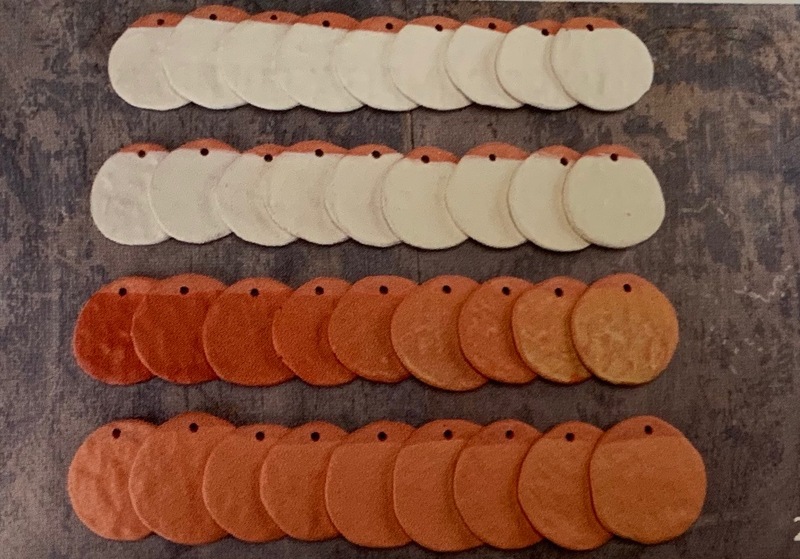 We will use Georgies ^6 glazes and cover brushing & application, layering, using gloss vs. matte and how they partner with our specialty glazes. 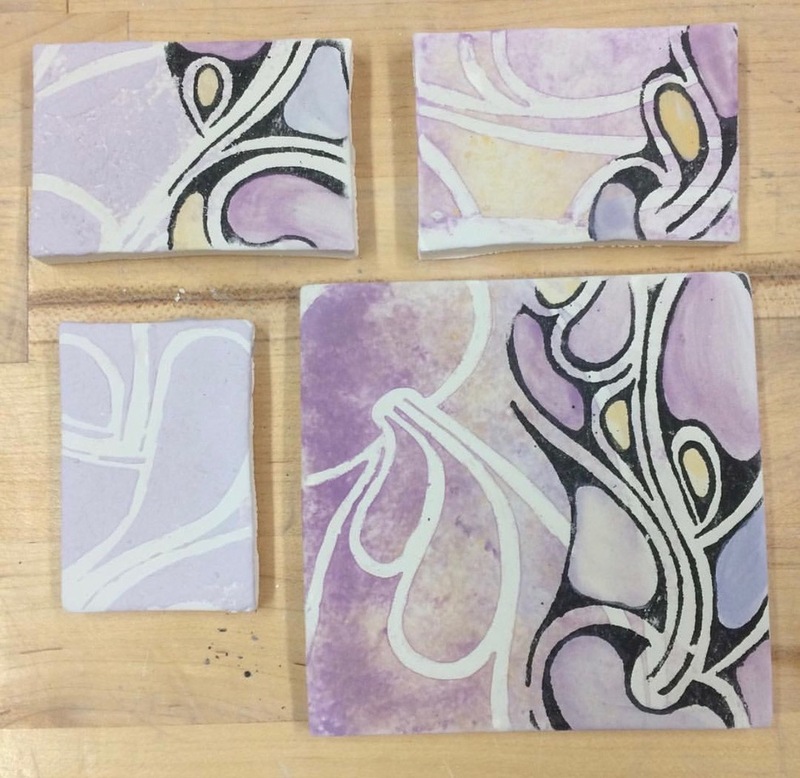 Class includes 6x6" tiles and glazes. Bring your brushes for glazing your pieces. Create your version of this sweet Bud Vase with templates and texture tools. Perfect for all those special summer blooms in your garden. Bring your tools for handbuilding. Whether you are a wheel thrower or a handbuilder, this skill building class will help you in creating new and exciting forms. Going from round to square or oval, darting to create drama ... Wil has static clay forms for you to out different shaping methods. Bring your tools for altering shapes. Katie will take you through the components and function of basic electric kilns. Class will cover how to change elements, relays and switches, thermocouples and kiln sitter tubes. Bring the model number of your kiln if available. This is our second glaze class that takes the lessons learned from the combos and layering and adds ways to create design. 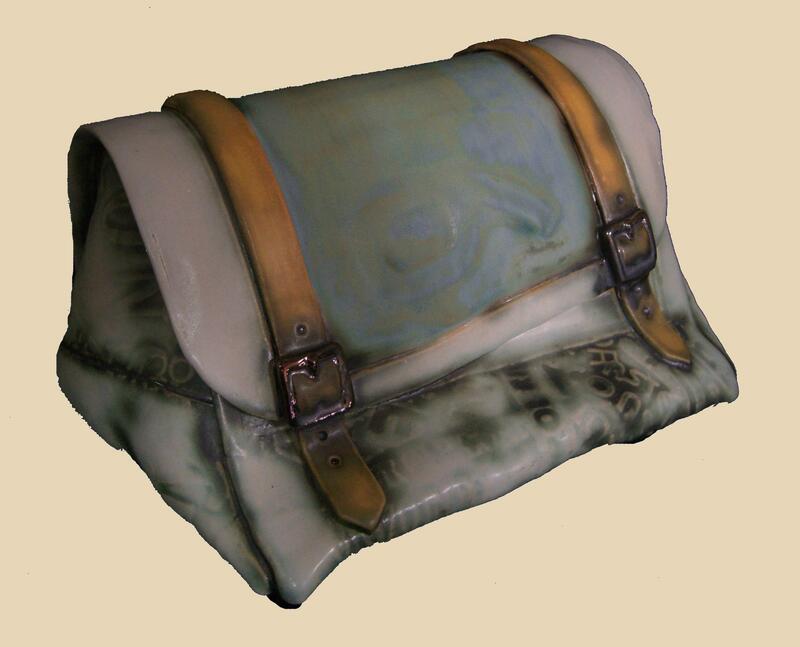 We will go over wax techniques, brush strokes, majolica, paper stencils and include Georgies Interactive Pigments along with our other glazes. Class includes 6x6" tiles and glaze supplies.. Bring a lunch and your brushes for glazing your pieces. Wear work clothes for this 6 hour class. 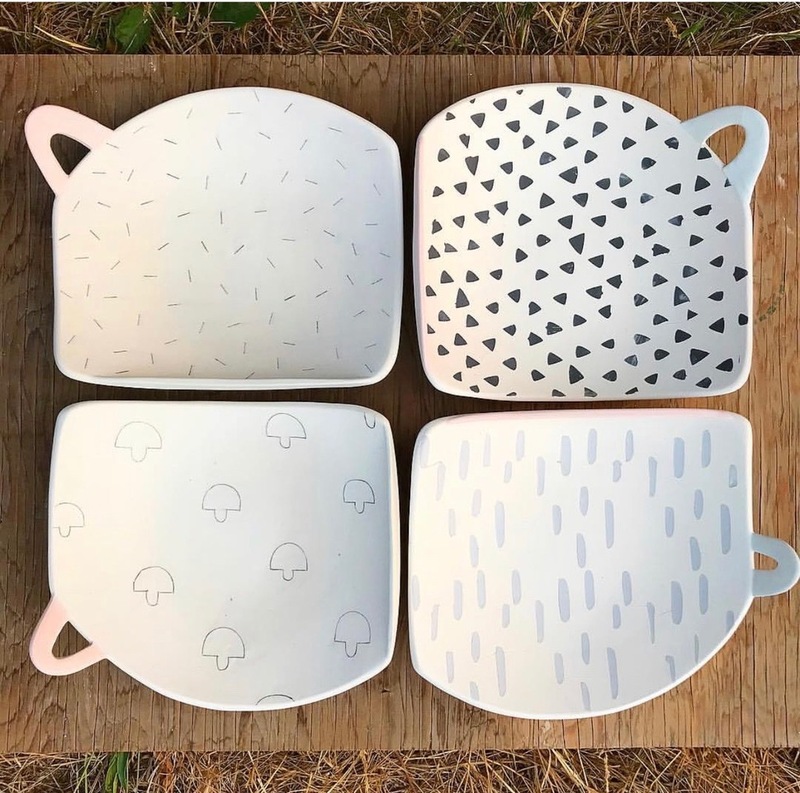 Want to create unique dinnerware or serving sets? This "hand-on" two day workshop will guide you toward making fun and clever forms for a variety of uses. Day one covers making and designing your forms. Day two covers slip, underglaze stencil decorations and how to complete your sets. All skill levels are welcome, but previous clay experience is recommended. A supply list will be included when you register for the class. Bring your lunch for both days. Stephanie is the master when it comes to using the Interactive Pigments to enhance the surface of your work! This workshop puts you in her world as you explore a variety of glazes along with their pigment enhancements. 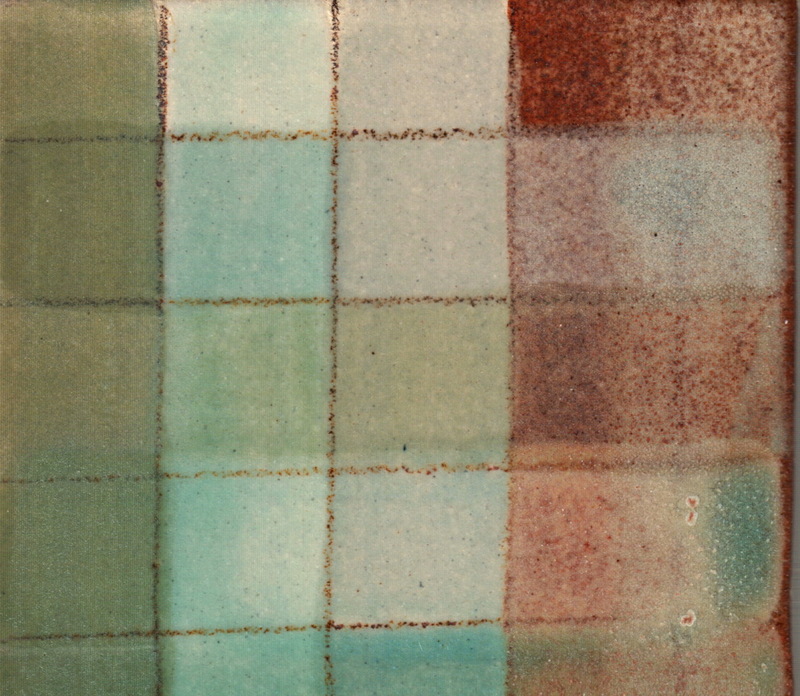 Class includes 6x6" tiles, glazes and pigments. Bring your brushes for glazing your pieces. Modeling and working figuratively can be very daunting. We have scaled this down to teach you how to create a small portrait head. This comes from our teacher workshop series and as we have discovered, making faces and heads is something most of us want to try! Bring your tools for handbuilding. 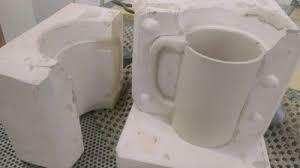 Slipcasting is seeing a resurgence and slip casting clays requre a bit of understanding. We will cover rheology, the various materials used to deflocculate your slip as well as how to corrrect your slip by weight and drip time. Included in the price of this demo/discussion is one gallon of either low-fire or stoneware ^6 slip for you to take home. Terrasigillata is one of the oldest forms of color and decorations known on the ceramic surface. It is also one of the most often "how to" questions that we get. We will go through the process of making terra sig and have some here for you to use on tiles. 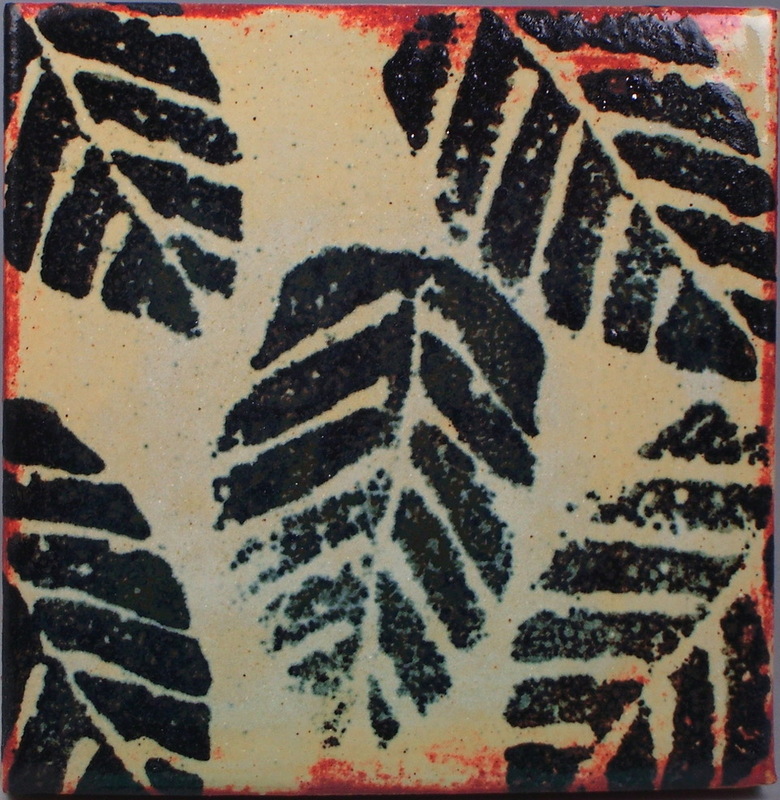 Class includes 6x6" tiles to use. Bring your brushes for glazing your pieces. This class will explore the techniques of using Horse Hair and Naked Raku. Don't know what that is? Come to the class to find out! Both methods produce dramatic results. Bring 2-3 small pieces of ^08 bisque or we will have bisque tea bowls for you to use. Whether your kiln is new or used, computerized or manual, Katie covers it all. Learn the nuts and bolts of firing, and how to operate and maintain your electric kiln for optimum results to achieve ceramic success with the proper firing. 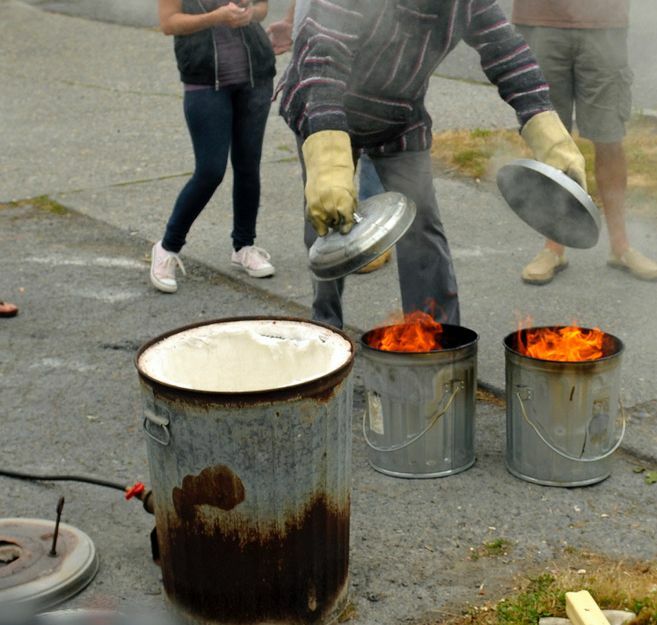 Questions about firing glass are welcome, but the class focuses on firing clay. Bring your notepads and questions! At the time of registration for our clay classes we request a $25 deposit and a credit card number to hold your reservation. The $25 deposit will not be refunded if you cancel your registration, but will be applied when you pay the rest of your class fee ($25 + $275 = $300). You will get a registration confirmation in the mail. We normally bill your class fee to your credit card number one week before the first class session. If you choose to pay by cash or check, please arrive before 5:00 pm on the first class day so we can complete your invoice. Call or email us as soon as possible if you have to cancel your registration.We have waiting lists for many of our classes, and your early call allows someone else to attend. 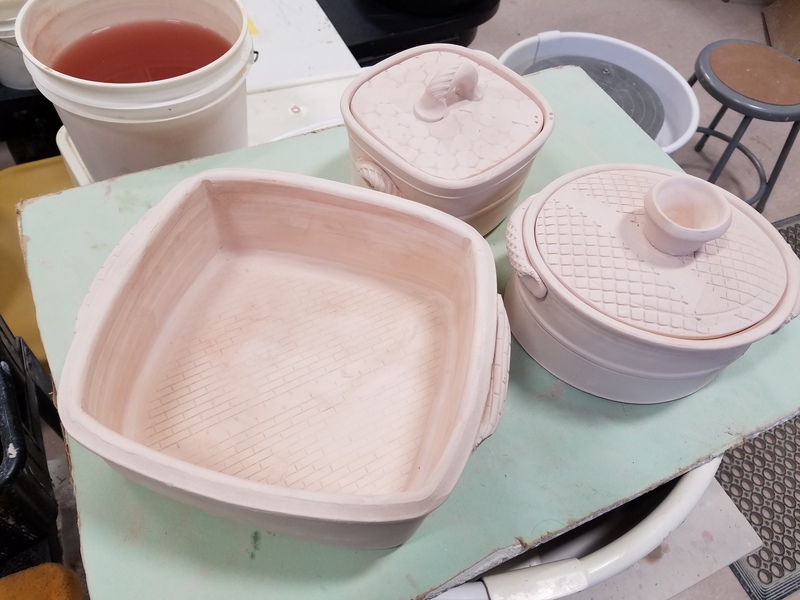 The fee for our clay classes includes Georgies classroom clay, use of Georgies glazes on your work, studio time to practice between class sessions (when there is not another class using the studio space), and firing your classroom work. Other clays and glazes are not included in the class fee. You'll have to purchase those on your own if you wish to use them. Cone 06 lowfire clays are NOT allowed in our classroom area for any reason.